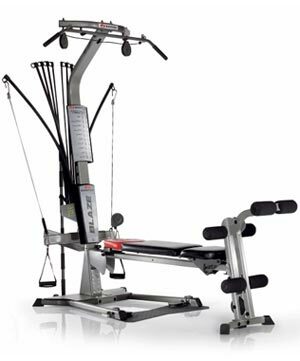 The Bowflex Blaze is the base model of all the available bowflex home gyms. At under $1,000, the bowflex blaze is the most economical setup bowflex has to offer. 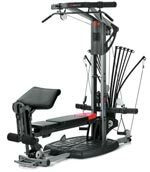 This "lite" version of bowflex home gym still provides all the basics and offers over 60 exercise. 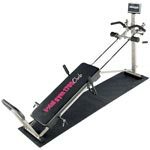 However, because of its toned down value, it does not come with many of the additional features available from the higher end models such as the Bowflex Revolution, Ultimate, or Extreme versions. But if you have a limited budget, and want a comprehensive home gym to train your entire body, look no further. While the bowflex blaze does not come with all the bells and whistles of the other versions, it still comes standard with 210lbs of power rod resistance, which is upgradeable to 310lbs or 410lbs. It does come with a lat tower, squat station, leg extension attachment, and aerobic rowing station. All of these basic added features will allow you to perform most exercises, and workout your entire body. With the bowflex blaze workout station, you can perform over 60 exercises target each and every muscle group in your body. 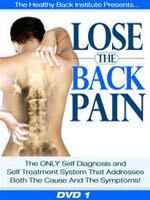 For back muscle, you can perform lat pulldowns, bent over rows, seated rows. For arms, you can perform a wide variety of exercises including tricep pushdowns, french presses, bicep curls, tricep extensions, wrist curls, and much more. You can workout your chest muscles by doing bench press, incline flys, incline bench press, decline bench press, and cable crossovers. Leg exercises include squats, leg extensions, leg press, standing kickbacks, leg curls. You can also build strong, toned shoulders with seated shoulder presses, shrugs, lateral raises, front raises, reverse fly, and much more. 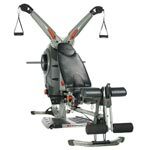 The bowflex blaze also comes with a rowing station that allows you to perform cardio workouts. These are just some of the exercises available from the bowflex blaze.